The video hub can be daunting at first--its archive has over 100 rounds, and the video list can be quite sprawling if you do not know where to begin. So how should one use the video hub to get the most out of it? Start by watching one of our slower rounds to get a handle on the national circuit. Lynbrook JK v Glenbrook North MR is a good example of a strong, substantive debate that does not go too quickly. Focus on keeping a neat flow and catching the debaters' main arguments. After each speech, pause the video and write a recap of what was said to make sure that you understood everything. If something is unclear, rewind the round and watch again--it will benefit you in the long-run. Once you are comfortable flowing and understanding arguments as they are spoken, try to expand into slightly quicker rounds, and continue to test your comprehension. The Pre-2010 Videos tend to feature many of these debates, although some will still move somewhat briskly. 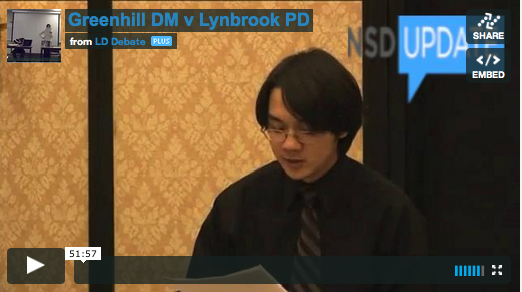 Greenhill DM v Lynbrook PD is a strong round from Finals of the 2007 TOC that should be fairly accessible after some practice flowing rounds. The round also contains the judges' RFDs on film, so you can listen to their reasoning and see how it compared to your evaluation of the debate. As you get better with the brisk rounds, do not be afraid to venture into the faster, more-recent rounds. It is only by listening to people speak quickly that you will grow to understand it, and it is better to get this experience at your own home than during an important round at a tournament. The skill takes time and practice; you have the means to do that in low-stakes scenarios. After every speech, pause the video and think what your strategy going forward would be as the opponent. For example, if the 1AC is very heavy on framework and light on contention-level offense, would you spend your seven minutes clashing heavily on the standard? Or would you concede their ethical framework and go for a bunch of turns? Deliver your chosen strategy, then resume the round and see how your choice compared to that of the opponent. Mercer Island SA v Scarsdale JY is a good example of a recent round where the 1AC forces you to make strategic choices early on; try it out! After the round's completion, pause the video before the judge's RFD and consider how you would vote. What should each debater have done differently in the round? What issues are difficult for you to resolve as the judge, and what could each competitor have done differently to make the decision easier? Listen to the judge's RFD (if available), and analyze how it lines up with your own. Do the steps recommended above for intermediate debaters; thinking strategically while watching rounds will keep you sharp for your own debates, and thinking like the judge will help you be big-picture in your final speeches. Add to the RFD analysis by imagining what the losing debater would ask of you after you announce your decision. For example, would they be wondering why you did not vote off the dropped turn? Then, figure out how you would respond to the objection, and practice doing so out loud. This exercise will ensure that you understand argument interaction and can quickly determine which issues are relevant. After the RFD analysis, go back to the round again and practice re-giving the final rebuttals to resolve any lingering issues for the judge. For instance, in the round above where one debater dropped a turn, practice extending the turn as a voting issue and making it relevant, answering the objections that you had as a judge. Then, practice debating as the opponent and trying to fend off the voting issue analysis. We hope that these tips will help you make the most of the NSD Videos hub. Watch a few rounds, and you'll be on your way in no time!